Whisk the yogurt and cornmeal in a medium bowl and let it stand for 45 minutes. Preheat the oven to 180°C/350°F. Butter and flour a 12-cup capacity Bundt pan . Combine the flour, baking powder, baking soda and salt in a medium bowl. Grind ¾ cup (97g) of the pistachios finely in a food processor (grind them with a couple of tablespoons of the flour mixture to avoid turning the nuts into a paste). Add the pistachio meal to the dry ingredients. Coarsely chop the remaining pistachios. Place the butter and sugar in the large bowl of an electric mixer and beat until fluffy, about 3 minutes, scraping down the sides of the bowl as necessary. On medium speed, add the eggs, one at a time, scraping down the bowl occasionally. Beat in the vanilla. On low speed, add the dry ingredients in three additions alternating with the yogurt mixture in two additions. Mix just until incorporated. Stir in the chopped pistachios. Scrape the batter into the prepared pan and smooth the top. Bake until risen and golden and a skewer inserted in the center of the cake comes out clean, 45-50 minutes. Cool in the pan over a wire rack for 10-15 minutes then carefully invert it onto the rack. Cool completely before serving. I am so guilty of this. I really need to pay more attention upfront to the recipes! Looks lovely! I do this all the time too! This looks fantastic at any rate--pinning now! Your cakes are always so enchanting! Same thing has happened to me so many times! Even when I reread the recipes! LOL. This pound cake looks great! I think my dad will love this! Happened to me sometimes, the rest part suddenly appears in the middle of the recipe so I have to wait longer than expected. I have made polenta cakes before and did not like the crunch from the polenta that was still hard. Soaking the grain is well worth the wait! 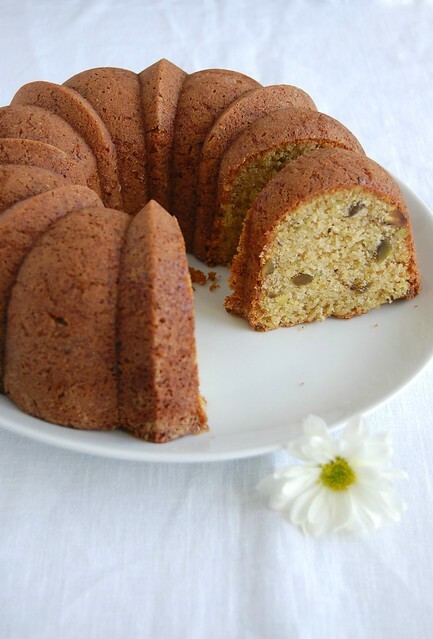 The pairing of pistachios with the polenta is an inspired combination, an exciting cake! Is this more savory or sweet? Hey, Mackenzie - it's sweet. I made this cake today and it is delicious. My husband and four of our neighbors (two of who are seven year old boys) agree. My husband commented that he appreciated the restrained amount of sugar which allowed the other ingredients to shine. I like how some of the pistachios are ground and some are chopped so you get plenty of pistachio flavor and nice textural contrast. Thank you for being so generous with inspiring recipes. Apple, pecan and gingerbread loaf + "Top Chef"